Kitsap Transit is moving forward with plans to launch cross-sound passenger-only ferries now that voters have approved its proposed business plan and 0.3% sales tax increase. Kitsap Fast Ferries FAQs: This information was presented in our first-ever webinar series. Schedule survey results: The survey was conducted from Feb. 21 to March 7. Reservations survey results: The survey was conducted from Jan. 12 to Jan. 25. 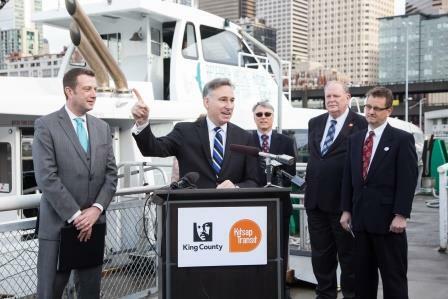 On January 18, Kitsap leaders sailed on the Rich Passage 1 to Pier 50 in Seattle, where they were welcomed by King County Executive Dow Constantine and County Council Chair Joe McDermott. 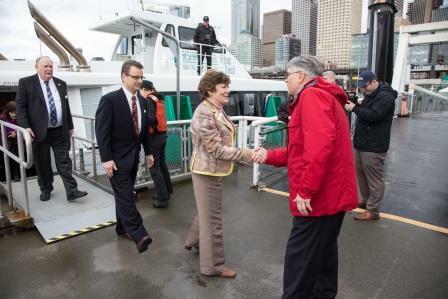 They as well as Bremerton Mayor Patty Lent and Kitsap Transit Chair Rob Putaansuu briefed the press on a public sector partnership to ensure the successful launch of Kitsap Transit's fast-ferry service. 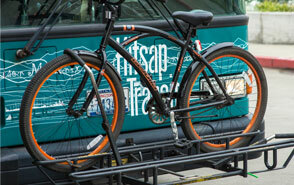 Kitsap Transit developed a business plan and long-range strategy for cross-sound passenger-only ferry service between Kitsap County and downtown Seattle. Kitsap Transit's Board of Commissioners approved, at its April 5, 2016 meeting, placing the plan on the November 8, 2016 ballot. The election results were certified on Nov. 29: Proposition 1 had 51.7 percent support, or 64,441 ballots in favor of the 124,616 ballots counted, according to the Kitsap County Auditor. A simple majority is required for approval. Read our Nov. 10 news release.